The right coronary artery courses along the right anterior atrioventricular groove just below the right atrial appendage and along the epicardial surface adjacent to the tricuspid valve annulus. It traverses along the tricuspid annulus until it reaches the posterior surface of the heart, where it then becomes the posterior descending artery and runs toward the apex of the left ventricle. 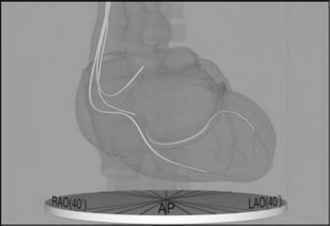 Along its course, a number of branches emerge, most notably those that supply the sinus node and the atrioventricular node; hence, blockage of such vessels can lead to conduction abnormalities. In addition, several marginal branches run to the right ventricular and right atrial epicardial surfaces. On exiting the ascending aorta, the left main coronary artery typically bifurcates quickly into the left circumflex and left anterior descending arteries. The left circumflex artery runs under the left atrial appendage on its way to the lateral wall of the left ventricle. Along the way, it spawns a number of branches that supply the left atrial and left ventricular walls. In some cases, a branch will course behind the aorta to the superior vena cava such that it can supply the sinus node. The left anterior descending artery supplies a major portion of the ventricular septum, including the right and left bundle branches of the myocardial conduction system and the anterior and apical portions of the left ventricle. Coronary arteries are so vital to the function of the heart that whenever disease states are associated with flow restriction through the coronary arteries, and subsequently the remainder of the coronary circulation (capillaries and veins), the effects on cardiac performance are quite dramatic and often fatal. Coronary artery disease is generally defined as the gradual narrowing of the lumen of the coronary arteries because of coronary atherosclerosis. Atherosclerosis is a condition that involves thickening of the arterial walls from cholesterol and fat deposits that build up along the endoluminal surface of the arteries. With severe disease, these plaques may become calcified and so large that they produce stenoses within the vessels, thus permanently increasing the vascular resistance, which is normally low. When the walls of the coronary arteries thicken, the cross-sectional area of the arterial lumen decreases, resulting in higher resistance to blood flow through the coronary arteries (see Chapter 1 regarding the inverse fourth power relationship). This steady decrease in cross-sectional area can eventually lead to complete blockage of the artery. 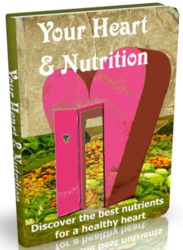 As a result, oxygen and nutrient supply to the myocardium drops below its demand. As the disease progresses, the myocardium downstream from the occluded artery becomes ischemic. Eventually, myocardial infarction may occur if the coronary artery disease is not detected and treated in a timely manner. Myocardial ischemia not only impairs the electrical and mechanical function of the heart, but also will commonly result in intense, debilitating chest pain known as angina pectoris. However, anginal pain can often be absent in individuals with coronary artery disease when they are resting (or in individuals with early disease stages), but induced during physical exertion or with emotional excitement. Such situations are associated with an increase in sympathetic tone that increases myocardial oxygen consumption and subsequently ischemia when blood flow cannot keep up with myocardial metabolic needs. To date, typical treatment for angina resulting from coronary artery disease includes various pharmacological approaches, such as coronary vasodilator drugs (e.g., nitroglycerin); nitrates to reduce myocardial demand by dilating systemic veins and thus reducing preloads; or p-blockers (e.g., propranolol). However, in cases of intractable angina, the use of implantable spinal stimulators for pain management has been suggested. Capillaries represent an extraordinary degree of branching of very thin vessels, which ensures that nearly every myocyte lies within a short distance of at least one of these branches. Via diffusion, nutrients and metabolic end products move between the capillary vessels and the surroundings of the myocytes through the interstitial fluid. Subsequent movement of these molecules into a cell is accomplished by both diffusion and mediated transport. Nevertheless, as with all organs, blood flow through the capillaries within the heart can be considered passive and occurs only because coronary arterial pressure is kept higher than venous pressure, which is the case during diastole. Although capillaries are a very important part of the coronary system, the use of devices within them is relatively nonexistent because they are so small. Conversely, in relation to the coronary arteries, the coronary veins make up a fine network of vessels beginning at the end of each capillary bed in the myocardium and ending at the right atrium. Usually, if a coronary artery is anatomically localized, a coronary vein will be close by because the coronary veins run alongside neighboring branches of coronary arteries. The largest and most prominent vessel in the coronary venous system is the coronary sinus, which is located on the posterior surface of the heart just below the left atrium in the left atrioventricular groove. Fig. 1 (see CoronaryVeins.mpg on the Companion CD) illustrates the path location of the coronary sinus in an idealized heart model. It is typically found to run along the epicardial surface of the heart as it carries deoxygenated blood into the right atrium from the coronary venous network of primarily the left ventricle. It serves the same purpose as a conduit for the return of deoxygenated blood to the right atrium from the coronary circulation of the left ventricle as the venae cavae do for the systemic circulation. The coronary sinus ostium enters the right atrium between the inferior vena cava and the septal tricuspid valve leaflet. 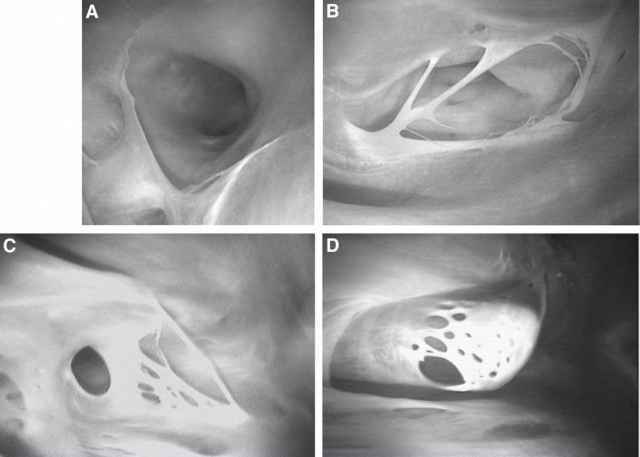 Often, a rudimentary flap of tissue called the Thebesian valve covers the ostium to varying degrees (4-7). Figure 2 shows several examples of human coronary sinus ostia as viewed from the right atrium (8). The coronary sinus also has a number of veins flowing into it. These branches typically include: (1) the great cardiac vein; (2) the oblique vein of Marshall; (3) the lateral and posterior veins of the left ventricle; (4) the middle cardiac vein; and (5) the small cardiac vein (9). More specifically, the vein that drains the circulation of the ventricular septum and anterior ventricular walls is the anterior interventricular vein. This vein runs toward the basal surface of the heart and is more commonly referred to as the great cardiac vein. It empties into the coronary sinus near the lateral aspect of the left atrium at its intersection with the atrioven-tricular groove. The point at which the great cardiac vein becomes the coronary sinus is also the location where the oblique vein of Marshall enters the coronary sinus after traveling along the posterior surface of the left atrium. The coronary sinus also accepts blood flow from the lateral and posterior veins of the left ventricle. These veins typically enter the coronary sinus on the lateral and posterior surface of the left ventricle, as their names would imply. The middle cardiac vein runs along the posterior surface of the left ventricle alongside the posterior descending artery. It then either spills its contents directly into the right atrium or will first enter the coronary sinus immediately before it enters the right atrium. The small cardiac vein drains the right ventricular and right atrial circulation before draining directly into the right atrium or into the coronary sinus near its ostium. Fig. 1. Movie illustrating a semitransparent heart as it rotates about its vertical axis. The path of the coronary sinus is highlighted during the first portion of the movie. The three leads implanted during a biven-tricular implant procedure are shown and labeled. See CoronaryVeins. mpg on the Companion CD. Fig. 2. Images of the coronary sinus ostium of four human hearts. Each image represents a single frame captured from images obtained from these isolated functioning human hearts (8). In the human, portions of the coronary sinus ostium can be covered by the Thebesian valves, hence making access more difficult (9). Reproduced with permission from ref. 8. © 2003 Society of Thoracic Surgeons. Fig. 3. 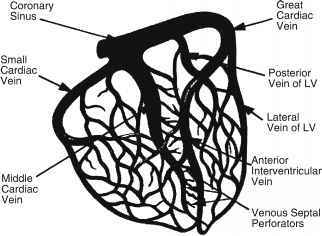 Diagram of the cardiac venous tree. This image represents the structure expected in a normal human heart. This is a 2D projection representation of the 3D nature of the coronary venous anatomy. LV, left ventricle. There are also a number of tiny veins called Thebesian veins that primarily drain the right atrial and right ventricular myocardium directly into these chambers without joining one of the principal coronary veins. Figure 3 illustrates a hypothetical coronary venous tree. In certain types of disease states such as heart failure, the shape and orientation of this vascular tree may change because of remodeling of the myocardium, for instance, to compensate for decreased contractile function of portions of the ventricular myocardium. Many tissues within the human body receive blood from branches of more than one artery, and if two or more arteries supply the same region, they are commonly connected. These connections, called anastomoses, provide alternate routes for blood to reach—particular group of cells. The myocardium may contain anastomoses that connect branches of a given coronary artery or extend between branches of different coronary arteries. They provide accessory pathways for arterial blood to reach a region of the myocardium if a main route becomes obstructed. It is then possible for the heart to receive sufficient oxygen even if one of its coronary arteries is partially blocked. It should be noted that, in certain disease states, the degree of anatomoses increases. Nevertheless, in severe stages of coronary artery disease, even extensive anastomoses will not allow certain regions of the myocardium to be adequately perfused; complete obstruction of blood flow results in a myocardial infarction. To treat such a patient, either the vessel needs to be reopened by coronary angioplasty and stenting or a new pathway should be created via coronary artery bypass grafting. Catheterization of the heart is an invasive procedure commonly employed for the subsequent visualization of the heart's coronary arteries, chambers, valves, and great vessels. It can also be used to: (1) measure pressures in the heart and blood vessels; (2) assess function, cardiac output, and diastolic properties of the left ventricle; (3) measure the flow of blood through the heart and coronary vessels; (4) determine the regional oxygen content of the blood (e.g., aortic and within the coronary sinus); (5) determine the status of the electrical conduction properties of the heart; and/or (6) assess septal or valvular defects. Basic catheterization techniques involve inserting a long, flexible, radio-opaque catheter into a peripheral vein (for right heart catheterization) or a peripheral artery (for the left heart) and delivery of the system under fluoroscopy (continuous X-ray observation). Commonly, during this invasive procedure, a radio-opaque contrast medium is injected into a cardiac vessel or chamber. The procedure may specifically be used to visualize the coronary arteries, the aorta, pulmonary blood vessels, and the ventricles. It can provide pertinent clinical information such as structural abnormalities in blood vessels that restrict flow (such as those caused by an atherosclerotic plaque), ventricular blood volumes, myocardial wall thicknesses, and/or wall motion. To date, the gold standard for visualizing the coronary system is coronary angiography. 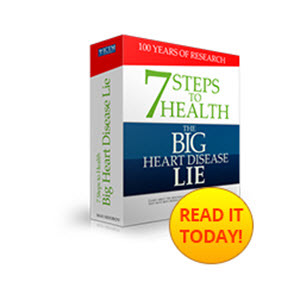 Yet, other methods for looking at the coronary system are under development. These methods include computed tomography angiograms and magnetic resonance angiograms. Through the use of injected contrast media and appropriate timing of image acquisition, these methods are providing researchers and clinicians with alternative ways to assess the presence of coronary plaques and stenoses. WHEN ARTERY SPILLS INTO RIGHT ATRIUM?